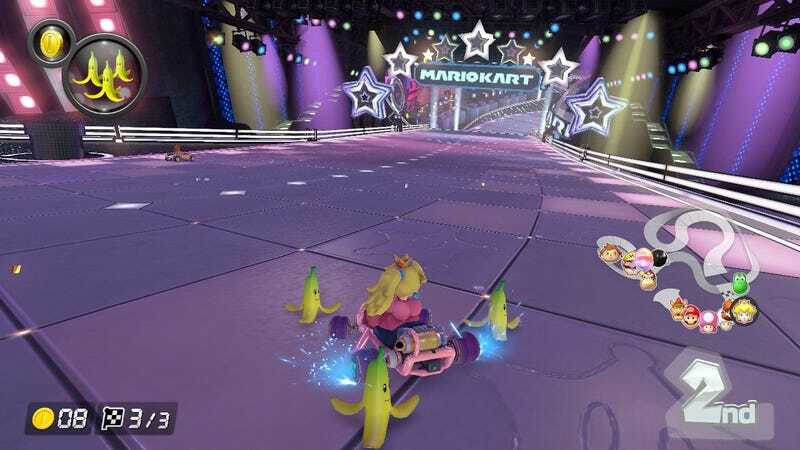 Even without voice chat, the game’s online multiplayer design felt like an international Mario Kart party. I loved watched everyone’s Mii run back into the lobby after a race, their faces glowing with excitement, no matter how badly they had done. If the Mii avatars are any indication of how players actually look, the Mario Kart player base is also quite diverse. But would we all get along so well, or be such good sports, if we could talk to each other? When the Nintendo Switch Online service launched this week and included voice chat support for Mario Kart (via Nintendo’s smartphone app), I assumed the worst. I said as much when I guested on Kotaku Splitscreen this week, joking that my competitors would be cursing out my blue shells in French. I wasn’t looking forward to hearing what my fellow racers had to say. But I had to know. Yesterday, I booted up the voice chat app and Mario Kart 8 Deluxe, selected the worldwide servers, and headed into a game. My first two races were quiet; only one other person had logged into the voice chat with me, and they didn’t have anything to say. On my third race, a couple of people had already logged into the chat. Conversation between the two strangers was well underway by the time I showed up, and they welcomed me with enthusiastic hellos. Soon after me, two more people logged in to join us. One of the chatters had designated themselves as an official welcomer, extending greetings to each person who joined and asking how they were doing. Another started up a running gag about Waluigi never getting any good items thanks to Nintendo’s unfair spurning of him. Everyone had different accents, as one would expect from the varied regional flags; a player who sounded British said “hello guv’nah” upon logging in, and I have no idea if it was ironic or completely genuine. Overall, though, the vibe with this group was genuine as heck. No one swore; no one lamented their losses. The trash talk never went further than squeaky clean stuff like “Show me what you got” or “This is a race, isn’t it?” Players would exclaim “Ohh, good one!” upon getting hit with unfortunate items. One player excitedly announced their placement after every match, no matter how low it was. In the lobby between matches, players could advocate aloud for which maps they most wanted the others to vote for next, but it never got too heated. I felt like I had entered some sort of polite parallel universe. It resulted in the most fun Mario Kart online session I’ve ever had—almost as good as the in-person Mario Kart parties I’ve hosted at my apartment with friends. Maybe I just got lucky and happened upon a good group. Or maybe Mario Kart’s multiplayer design has already encouraged politeness and so the culture is already in place. I’m not sure how long that’s going to last, or whether I’m going to bother to boot up my phone’s app every time I want to play a match. Still, it was nice to know that the friendly Mii faces in the lobby correlated with some real-life laughter and enjoyment from my competitors around the world, even if only this once.